Do you have CPAP mask leaks? In this page you'll learn how to solve this problem. Regarding the CPAP therapy for sleep apnea, the mask leaks, even the small ones, are very important. The CPAP machine is simply a way to use air pressure as an internal splint to keep the airway open. Pressure that is insufficient to keep them open renders the CPAP therapy ineffective. Whenever there is a CPAP mask leak your brain tries to compensate with biochemical responses that are not beneficial but are simply desperate measures the brain is attempting to take. The seal leak is the most often leak problem found in CPAP therapy. It appears when the air from the breathing machine is leaking between the "mask" and your face. The mouth leak appears when you sleep with your mouth open, and an important quantity of air pressure exits instead of entering in your lungs. significant leak may disturb you, by blowing in your eyes, or making noises or causing arousals or - for mouth leaks - producing increased airflow though your upper airway and drying out your nose and mouth with a variety of resultant problems. 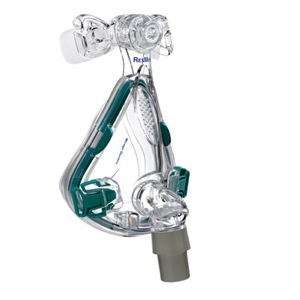 How to Prevent the CPAP Mask Leaks? If you already have a CPAP mask, and you're struggling to eliminate the air leaks that can appear during your nightly therapy, there are some useful tips that can be done to prevent those leaks. If you're still struggling with leaks even after you've done everything you can with your CPAP mask, there is another helpful tip that I discovered while navigating the internet. While you sleep, the muscles that move the jaw relax, causing your face to change shape. Well, an ingenious CPAP user found a way to prevent this problem, using a boil and bite custom fit mouth piece that has a hole for easy breathing. 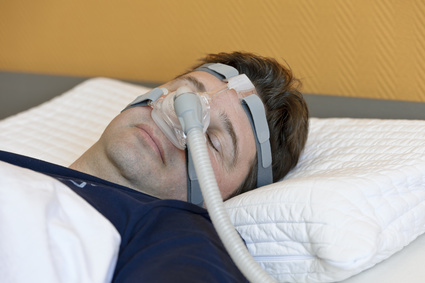 What should you do before buying a CPAP mask? Next time when you visit the Durable Medical Equipment (DME), take a blanket and a pillow with you if they don't supply a bed for you to lay on during the mask fitting. Look at all these CPAP masks and narrow the field to a couple you want to try. Standing up, adjust the headgear loosely. The mask should still feel like it's a fraction away from falling off. Now lay down on the bed (coat or blanket) on your back. Adjust your pillow comfortably. 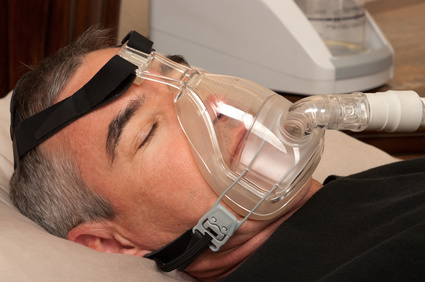 If the DME supplier doesn't provide a CPAP at your pressure to fit masks, bring your own CPAP with you. Plug it in, attach to this mask and turn it on. Lift the mask from your face just a bit to let it fill with air. Let it lay back down on your face and make any adjustments to the headgear straps you need. The mask should fit comfortably, not tight. Don't worry about minor air leaks at this point. For them you don't tighten but rather you run your fingertip along the seam between the mask's outer cushion cover and your facial skin. That should eliminate the minor leaks. For CPAP mask leaks near the eyes, lift the mask from your face just a bit, once it refills with air let it lay back down on your face a trifle low on the bridge of your nose. Now slide the mask just a bit up to the bridge of the nose to where you want it. That should both seal any minor leaks and turn the edges of the mask cushion cover under so it doesn't cut into the skin. For CPAP mask leaks under or around the lower part of the nose try twitching your nose, or wagging your jaw back and forth or screwing your lips up every which way. Often that's all that is needed to seal those minor leaks. Now turn over to one side and make any necessary minor adjustments for leaks as above. Then turn over to your back and to your other side making any necessary minor adjustments. At no time should the mask fit too tight or uncomfortable. The longer you wear the mask like that the tighter and more uncomfortable it is going to feel. If none of this works, forget this mask and try another until you find one that seems like it is gonna work for you. That mask is the one to take home. Its gonna take another week at home for you to be sure you can sleep with this mask for sure. When you find a mask that almost works be sure to look it over good and compare it to the next one you are interested in trying. Look closely at the distance between the nose cushion inside top of nose area and the cushion at the inside bottom of the nose (or chin or lower lip if a full face). Had the one you tried felt like it was too long or too short? How does this other one compare in that length? The same holds true for the width distance both at the bridge of the nose and lower at the cheeks and around the mouth. Its the inside opening of the cushion that is important, not the outside measurements. Many of us need to be able to adjust the angle between the forehead and the bridge of the nose. The wrong angle can account for a lot of the discomfort at the bridge of the nose. Generally, the top straps looser than the bottom straps will help to avoid the discomfort at the bridge of the nose. After you have the straps adjusted, raise the mask off your face an inch or so and then position it back on your face for optimum seal. For patients with ResMed Quattro full face mask - dual wall cushion masks are extremely high quality, and can be worn surprisingly loose. Make sure you are not overtightening - and make sure you are "seating" the cushion. Think gravity when you adjust your mask. If you side sleep, it will be a bit tighter. If you sleep on your back, you will find a looser fit. If you toss and turn and sleep in all positions during the night, realize that gravity takes over and your mask may need readjusting to accommodate your different sleeping positions. Full face masks are large in size, and when you side sleep, the frame may be pushing up in to your cheek area and moving off center causing pressure point soreness or leak. That would be enough for anyone to take the mask off during the night! If you still have mask leaks or comfort problems, consider changing the pillow that you have now with a special CPAP pillow called the papillow. They are purposely filled at a medium to medium/firm weight in order to provide the support and keep the unique shape stable. The pillows have a bottom curve the allows support for neck and head and then offers a curve on left and right side to allow the positioning of our head so our mask can literally suspend off the edge of the pillow. 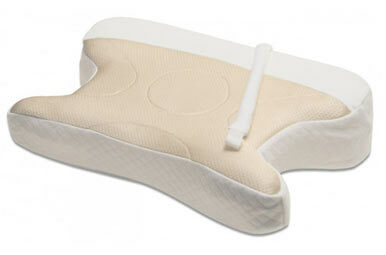 You can see and learn more about CPAP pillows here.